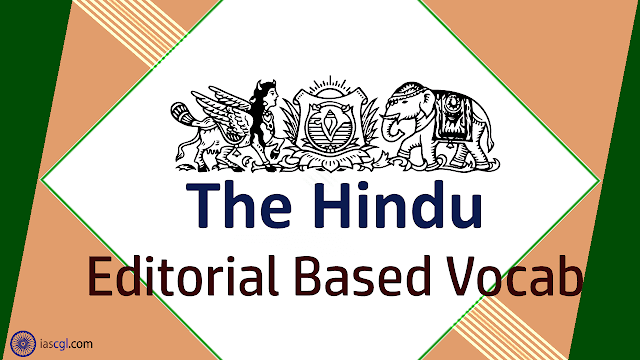 HomeVocabThe Hindu Vocab 19th September 2018 For Competitive Exams. The Hindu Vocab 19th September 2018 For Competitive Exams. Vocabulary from The Hindu Editorial 19th September 2018 for Staff Selection Commission(SSC) Combined Graduate Level, Combined Higher Secondary Level, Bank PO, Clerk and other state Government Examination. Discussing the current contest between opposing ideas of India, Malini Parthasarathy hit the nail on the head when she wrote, “Neither the Congress nor other opposition parties acknowledgeemphatically that what is really unfolding in the political arena is a fundamental contest between the original pluralist vision of Indian democracy and the monocultural and exclusivist view of the Hindu nationalists” (“India’s shrinking democratic space”, September 15). The lack of clear vision on the part of the Congress was demonstrated above all by Congress president Rahul Gandhi’s constant attempts to prove his religiosity in the run-up to the Assembly elections in Gujarat and Karnataka by visiting temples and advertising his Brahmin antecedents, which he is now doing in Madhya Pradesh. The strategy appeared to fail earlier in both cases: the BJP won Gujarat, while in Karnataka, despite the Congress’s success in forming a coalition government, there is little doubt that it faced a stinging defeat. The fundamental problem with the Congress is that it confuses demonstrations of personal religiosity, even if undertaken to achieve political ends, with political Hindutva, a clearly defined political ideology owing its origins to Vinayak Damodar Savarkar, K.B. Hedgewar and M.S. Golwalkar, and not to the religious tenets of Hinduism. This ideology, to quote Ms. Parthasarathy, “question(s) the basis of India’s composite nationhood” and advocates an exclusivist agenda which is best summed up in the slogan “Hindi, Hindu, Hindustan”. One can term this “active Hindutva”, that maligns minorities and glosses over atrocities committed on them. The Congress has been increasingly adopting “passive Hindutva” symbolised by temple visits particularly during election time. It is a strategy based on the theory that if you cannot beat them, then join them. However, the Indian electorate has sufficient political acumen to distinguish between the genuine article and its pale imitation. The Congress is thus ceding ideological ground to the BJP and writing its own death warrant. Those who support the exclusivist majoritarian agenda would rather vote for the “hard” Hindutva of the BJP than Congress’s “soft” Hindutva, which to them epitomises hypocrisy. What the Congress needs to do is to return to its philosophical roots and clearly lay out a vision of a composite nation, as imagined by Gandhi and Nehru, which is imperilled by the BJP’s ideological onslaught. Mr. Gandhi and his advisors do not have the capacity to articulate such a vision. They are too busy nitpicking on small issues that will have little impact on the electoral contest while aping the BJP’s strategy hoping that it will help them win the next general election. To put it mildly, they are living in a fool’s paradise because imitators can never outshine the original product. Imitation: नकली - a thing intended to simulate or copy something else. Nail: नाखून - a small metal spike with a broadened flat head, driven typically into wood with a hammer to join things together or to serve as a peg or hook. Acknowledge: स्वीकार करते हैं/स्वीकार करना - accept or admit the existence or truth of. Emphatically: प्रभाव से - in a forceful way. Unfolding: खुलासा - open or spread out from a folded position. Arena: अखाड़ा - a level area surrounded by seats for spectators, in which sports, entertainments, and other public events are held. Pluralist: बहुलवादी - a member of the clergy who holds more than one ecclesiastical office at a time. Despite: के बावजूद - outrage; nevertheless. Stinging: चुभता - wound or pierce with a sting. Coalition: गठबंधन - an alliance for combined action, especially a temporary alliance of political parties forming a government or of states. Tenets: सिद्धांतों - a principle or belief, especially one of the main principles of a religion or philosophy. Maligns: दुष्ट - evil in nature or effect; malevolent. Glosses: व्याख्या - the action of explaining the meaning of something. Atrocities: अत्याचारों - an extremely wicked or cruel act, typically one involving physical violence or injury. Acumen: कुशाग्रता - the ability to make good judgments and quick decisions, typically in a particular domain. Ceding: सौंपना - give up (power or territory). Onslaught: हमला - a fierce or destructive attack. Articulate: स्पष्ट, गाँठदार - (of a person or a person's words) having or showing the ability to speak fluently and coherently. Nitpicking : महत्वहीन त्रुटियां ढूंढ़ना - fussy or pedantic fault-finding.